Got ham? I did. Being my first attempt at preparing a holiday spread on my own, I went out and bought the biggest spiral ham Wegmans had to offer. Nearly 11 pounds of ham for 7 adults. It was bone-in and I had no idea how much that weighed, so better safe than sorry, right? The day after Christmas, I decided to put my hypothetical apron back on and put all that extra ham to good use. Hello Pinterest. 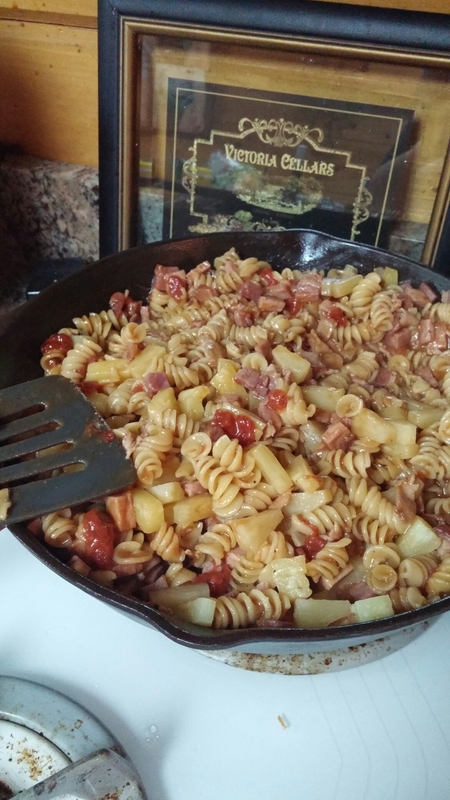 I found a potential recipe adding leftover ham to a one pot pasta dish. Pasta and one-pot are my favorite kind of recipes. But this particular recipe wasn’t quite right in my mind so I decided to combine it with another one pot pasta recipe. The results were a leftover ham paradise. 1. In one of your biggest skillets, cook the bacon until crispy over medium heat. Drain almost all of the grease carefully – it is hot. I never know exactly what to do with the grease, so I usually pour it into an old jar. 2. Add ham to the bacon and heat over medium heat. The ham is cooked so you are really just heating it up and getting it saturated in bacon grease. Yum. 3. Add diced tomatoes, milk, chicken broth. Stir to mix it all together. Add rotini pasta. And, you got it, stir again. I like to make sure all the noodles are in the liquid, even if not completely submerged. 4. Bring to a boil, cover and reduce heat. Simmer for about 15 minutes, or until pasta is cooked the way you want to eat it. 5. Stir in BBQ sauce and pineapple tidbits until heated through. Just a couple of minutes on low heat. 6. Enjoy your re-discovered holiday ham! Now, we are basically a no cheese house. The hubs has an aversion to cheese on anything except pizza. I am not a cheese junkie, so no need to add extra calories. Both of the recipes I consulted to create this called for cheese. One called for 1 cup of cheddar, the other for 1 cup of mozzarella. So, if you like cheese, take your pick and add it at the end, and cover til it melts.